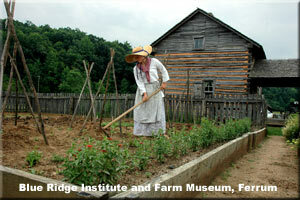 The Blue Ridge and Farm Museum is the State Center for Blue Ridge Folklore and highlights the deep roots that folklore has on this region. The galleries explore folklife's many facets--music, crafts, foodways, decorative arts, etc.--through rotating exhibitions. There are also hands-on activities and a great shop on location where you can buy authentic folk crafts from the region.